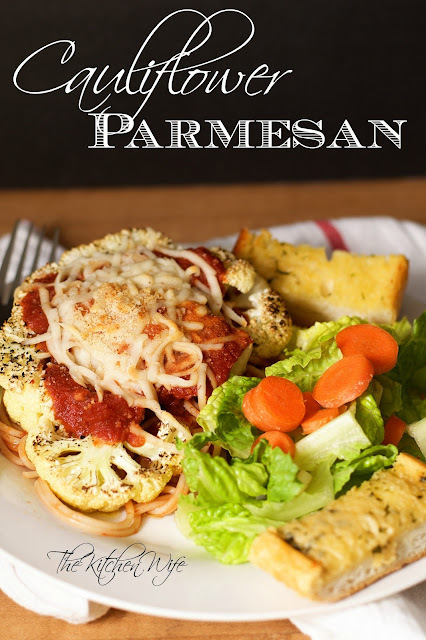 Meatless March continues with my favorite recipe to date, Vegan Cauliflower Parmesan. A plant-based take on the chicken classic, this dish is a real game changer in the kitchen. One of the things I love most about this recipe is that it is a one-pan meal, so to begin you will need to preheat the oven to 400 degrees. While the oven is coming to temperature, you will need to trim the leaves from the bottom of the cauliflower as well as trim off the end of the stem. Next cut the head of cauliflower into 1/2 inch thick steaks. Now lay them flat onto a baking sheet. After everything is on the baking sheet you will need to drizzle the olive oil over all of your cauliflower steaks. You can take a brush and brush it over them evenly if you like. Okay, confession time. Now ALL of your head of cauliflower will slice into beautiful steaks, but don't worry. I took the large florets, place them together in the shape of a steak, and it worked just fine. Now place the seasoned cauliflower steaks into the preheated oven for 25 minutes. Look at how beautiful that it! Tender, but not mushy and full of flavor from all of the great seasoning. Oh how I wish you could smell this. Now you will spoon some of the marinara sauce on top of the cauliflower steaks. Before you ask, YES, you can make your own marinara and use that, but for simplicity's sake I am using my favorite jarred sauce. And don't worry about the rest of the jar going to waste. I serve this with spaghetti so I pour the rest of the jar into the pot of drained pasta and toss it around until it is fully coated. Now it is time for the cheese. That's right, I SAID CHEESE!!! I found this AMAZING almond cheese from Trader Joe's and it blew my mind. I gave it to two other people in my house without telling them it was dairy-free and no one could tell the difference! I highly recommend you give it a try! Sprinkle the cheese on top of the cauliflower steak. Then, for good measure, I sprinkled a little bread crumb on the top for the "breaded" affect. But the Cauliflower Parmesan back in the oven for another 5-10 minutes and you are ready to go! And there you have it! 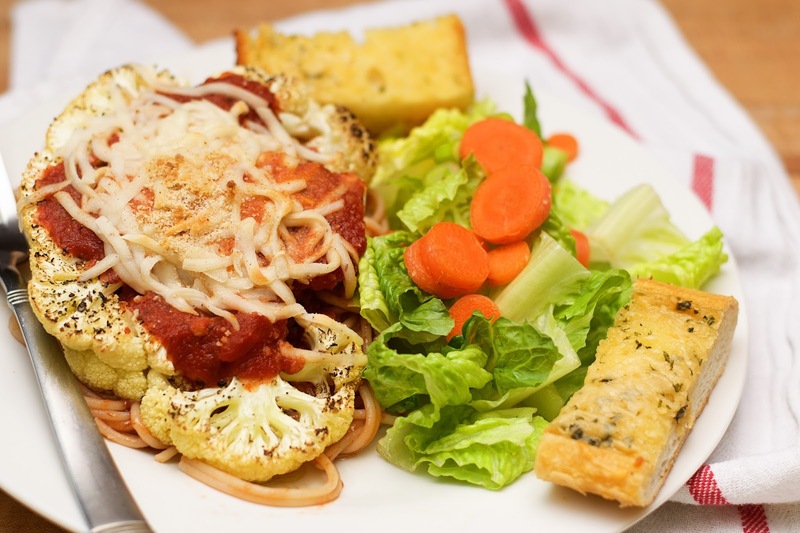 A beautiful Vegan Cauliflower Parmesan. As I said earlier, this has been my favorite recipe to date during Meatless March. I won't lie and say that it taste like chicken, but it is filling and gives you that "meatiness" you long for in a good parmesan. I know you are going to love it so give it a try tonight! Trim the leaves from the bottom of the head of cauliflower as well as the end of the stem. Place onto a foil lined baking sheet, drizzle with the olive oil and season with the salt, pepper, and Italian seasoning. Place in the preheated oven and bake for 25 minutes. Place back into the oven for another 5-10 minutes. *Not all of the cauliflower will cut into nice steaks. I simple placed the large florets together in the baking sheet and it worked just fine. **To keep from wasting the marinara sauce make some spaghetti and toss the sauce with the finished noodles to serve until the Cauliflower Parmesan. **You can use regular mozzarella cheese if you like.